Q: According to reports, students of Niles North High School in the US State of Illinois recently wrote a letter in Chinese to President Xi Jinping, and President Xi replied to them. Can you tell me why he wrote back and what's the significance of his letter? A: You may have learned from the news that President Xi Jinping recently wrote back to the students of Niles North High School in Illinois and encouraged them to contribute to the friendship between the Chinese and American people. As far as I know, this is not the first time that President Xi Jinping wrote back to foreign students, which tells us how much President Xi values people-to-people exchange and cooperation between China and other countries. This time, the letter President Xi received was written in Chinese by over 40 students from a Chinese class of Niles North High School in Illinois. They raised many interesting questions in the letter. In his reply letter, President Xi answered those questions about his work, life, and hobbies, encouraged them to make new progress in learning Chinese and contribute to the friendship between the Chinese and American people, and welcomed them to China for a visit. I learned that most of the students who wrote the letter have never been to China or had learned any Chinese before starting the class. After just one semester, they became very interested and decided to write a letter in Chinese to President Xi to extend the heartfelt greetings of American high school students. 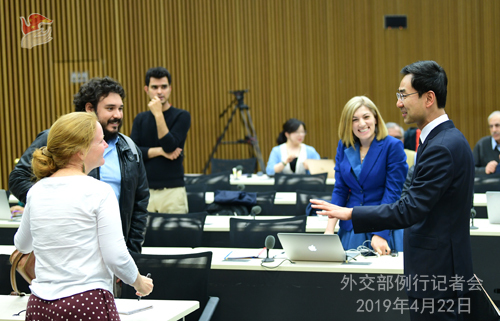 We are pleased to see in the young generation of the US such a strong interest in the Chinese language and culture and such pure friendliness towards China. Just as President Xi wrote in the letter, the youth represent the future of China-US friendship. We hope our two countries can join efforts to deepen cultural and people-to-people exchange and cooperation in youth, education and other fields, enhance the mutual understanding between our two peoples and strengthen the public support for China-US relations. Q: According to media reports, the second round of voting in Ukraine's presidential election concluded at 8 o'clock (local time) on April 21. After exit poll results were released, Petro Poroshenko conceded defeat and congratulated his rival Volodymyr Zelenskiy who declared victory. Do you have any comment on it? 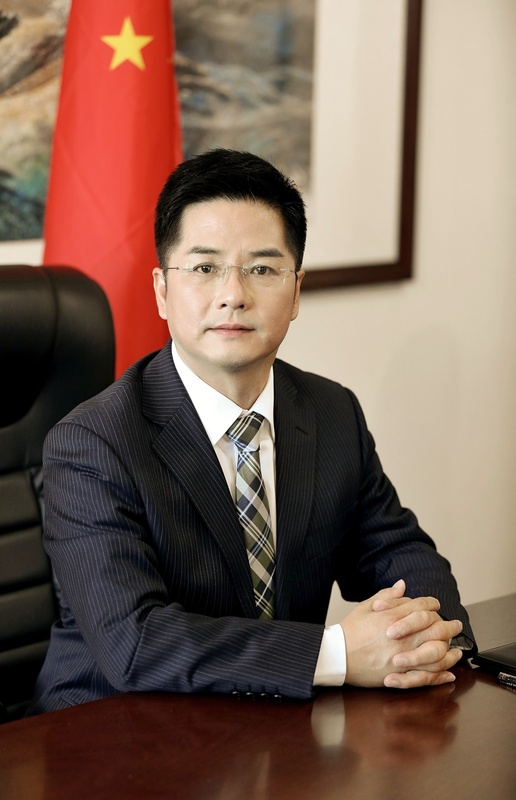 Has China sent a congratulatory message to Zelenskiy? A: Ukraine is a friend of China's. We respect the Ukrainian people's choice and sincerely wish the country peace, stability and prosperity. We attach importance to China-Ukraine relations and will work with the Ukrainian side to advance our cooperation in various fields under the Belt and Road Initiative. Q: According to media reports, US Secretary of State Mike Pompeo said the US would not renew the sanctions waivers on oil exports from Iran after May 2. Does China have a comment? 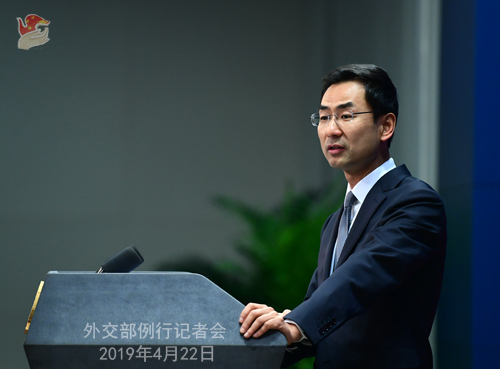 China opposes the unilateral sanctions and so-called "long-arm jurisdictions" imposed by the US. Our cooperation with Iran is open, transparent, lawful and legitimate, and thus should be respected. Our government is committed to upholding the legitimate rights and interests of Chinese companies and will play a positive and constructive role in upholding the stability of the global energy market. Q: Reports say hundreds of people were killed or injured in a series of bomb blasts in Sri Lanka's capital Colombo and other cities on April 21. Do you have any comment on that? A: On April 21, heavy casualties were caused by a series of blasts in Sri Lanka's capital Colombo and other cities. President Xi Jinping, Premier Li Keqiang and State Councilor and Foreign Minister Wang Yi have sent messages of condolences to Sri Lankan President Maithripala Sirisena, Prime Minister Ranil Wickremesinghe and Foreign Minister Tilak Marapana respectively, expressing deep condolences to the victims and sincere sympathy to the injured and the bereaved families. In their messages they emphasized that the Chinese government and people stand firmly with the Sri Lankan people and resolutely support Sri Lanka in safeguarding its national security and stability. 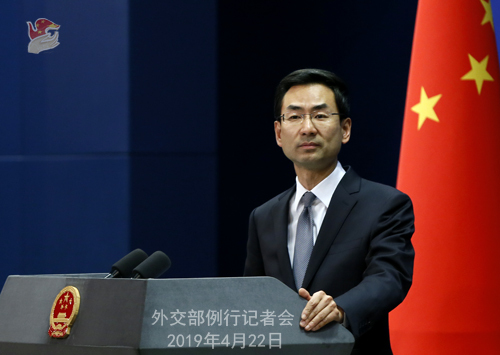 After the incidents took place, the Chinese foreign ministry and the Chinese embassy in Sri Lanka immediately activated emergency response mechanisms, prioritizing the verification of casualties of Chinese citizens. We have been doing our best to look for the missing persons, sent our staff to visit the injured, and reminded Chinese institutions and individuals there to take precautionary measures to ensure safety. Results of an initial verification show that there were Chinese citizens killed or missing in the incidents. Five Chinese were injured but not in life-threatening conditions. They are now receiving medical treatment and their conditions are stable. We will closely monitor the situation and spare no efforts in our work. For Chinese citizens in Sri Lanka in danger, please dial 0086-10-12308, the Chinese foreign ministry's hotline for consular protection, or contact our embassy in Sri Lanka via its consular protection hotline 0094-11-2676033. Q: The Indian Foreign Secretary Vijay Keshav Gokhale is reportedly visiting China and held talks this morning with State Councilor and Foreign Minister Wang Yi. Can you just update us on the details of the talks and the issues discussed? A: Indian Foreign Secretary Vijay Keshav Gokhale is visiting China from April 21 to 22. This morning, State Councilor and Foreign Minister Wang Yi met with him and Vice Foreign Minister Kong Xuanyou held talks with him. As far as I know, Vice Foreign Minister Le Yucheng and Deputy Director of the Office of the Foreign Affairs Commission of the CPC Central Committee Liu Jianchao will meet with him respectively this afternoon. In the meeting and talks held this morning, the Chinese side said that as neighboring major countries, representatives of emerging economies and strategic cooperative partners, China and India should step up strategic communication, enhance political mutual trust and maintain close coordination and cooperation in international and regional affairs. Our shared interests far outweigh differences. The two sides need to strengthen solidarity and coordination, keep the positive momentum of the sound and steady development of bilateral relations achieved since the Wuhan summit between our leaders, and uphold the common interests of emerging markets and developing countries. Foreign Secretary Vijay Keshav Gokhale said in the meeting and talks that since the Wuhan summit, the two sides have had active political interactions, advanced practical cooperation and successfully held the first meeting of the India-China high level people-to-people exchanges mechanism. India stands ready to maintain high-level exchange with China, enhance mutual understanding, accommodate each other's concerns and strive for greater progress in bilateral relations. 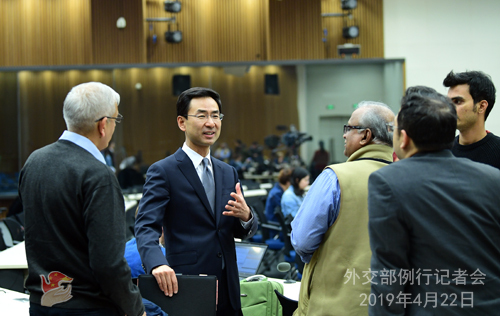 Follow-up: Did the two countries discuss issues related to the listing issue at the 1267 Committee and India's participation in the Second Belt and Road Forum for International Cooperation? A: I've just briefed you on the meeting and talks held this morning. As I said earlier, the shared interests between our two countries far outweigh the differences. We hope the two sides can strengthen coordination and communication and keep the positive momentum of the sound development of bilateral relations. China stands ready to work with India to this end.